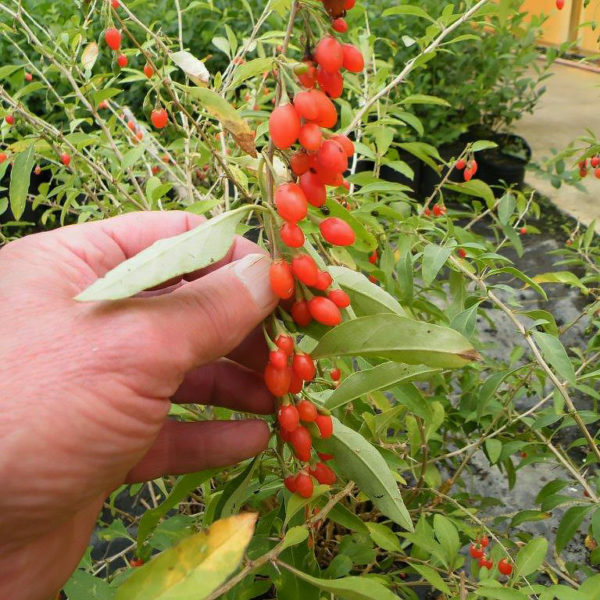 The Phoenix Tears Goji Berry (Lyceum barbarum) is native to parts of Asia. The deep orange-colored fruits are high in nutrients, with carotene levels higher than found in carrots. The jellybean-shaped fruits ripen over a long period in mid-summer, with up to four weeks of harvest. Ripened fruits adhere to plant stems for long periods of time. Fruit has sweet flavor with slight acidity. The multi-stemmed shrub grows to 5 to 6 feet tall and 5 feet wide. Train branches with a simple one-wire trellis to ease harvest and support the many pounds of ripened fruits produced. Small, light violet-colored flowers that produce fruit appear in late spring on plant stems that are at least two years old. The cold- and drought-tolerant plants can be grown successfully in Zones 3-8.